This has not been a good news year for the world’s oceans. Scientists found an increase in the number of dead zones, documented acidification along the Pacific coast of North America, produced a startling map of the human impact on the global oceans, warned about the decline of Caribbean coral reefs, and detected an increase in the unproductive mid-ocean "deserts". The UNEP Rapid Response Report on the status of the world's fisheries, released in February, had the ominous title "In Dead Water". For a change, here is a story about the recovery of a marine ecosystem from the most extreme of disturbances. A team of scientists conducted a survey of the coral communities of infamous Bikini Atoll in the Marshall Islands. The results were published earlier this year in a fascinating paper by Richards et al. in the journal Marine Pollution Bulletin that I finally had the chance to read. 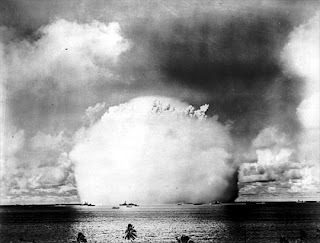 Between 1946 and 1958, the U.S. government conducted 23 nuclear tests at Bikini Atoll. You can easily see some of the impact craters using Google Earth the photo at right is a 23 kton test in 1946). The Bikinians were forcibly removed, a story that cannot be told enough. The Bikinians today live on Majuro Atoll, the capital of now independent Marshall islands. 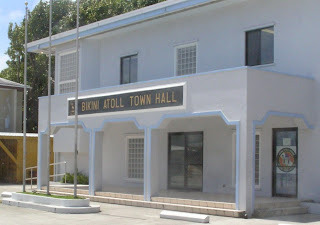 I took this photo of the displaced Bikini Town Hall during a short stay in Majuro a few years back. (It's a a long story; if your only way home involves the only plane of Air Nauru, a bankrupt airline from a rapidly depopulating island nation, you do what the ticket says). The experience of the Bikinians – or the people of Rongelap, or the Banabans forced to buy an island in Fiji, or the i-Kiribati moved to the Phoenix Islands and back – is a lesson to all those who think it would be “easy” to move communities from islands threatened by climate change. Forced resettlements, whether due to colonial management, World War II, or environmental degradation, have been in many cases disastrous for those leaving their home, those already living in the new home, and the more powerful actors “orchestrating” the migration. But that's an issue for another day. Back to the corals. Post-test descriptions of environmental impacts include: surface seawater temperatures raised by 55,000 C after air-borne tests; blast waves with speeds of up to 8 m/s; and shock and surface waves up to 30 m high with blast columns reaching the floor of the lagoon... Coral fragments were reported to have landed on the decks of the target fleet deployed within the lagoon... The most publicized of the Bikini tests, ‘Bravo’... destroyed three islands causing millions of tonnes of sand, coral, plant and sea life from Bikini’s reef to become airborne. The sediment regime in Bikini was fundamentally altered by the nuclear events because millions of tonnes of sediment were pulverized, suspended, transported and then deposited throughout the lagoon by wind-driven lagoonal current patterns. Five decades later, Richards et al. 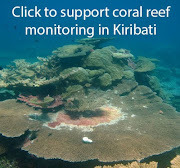 found 183 species of hard corals living around Bikini (note: the increase from the pre-tests results is likely due to more thorough surveys and better taxonomic knowledge). It is a remarkable recovery considering the complete devastation caused by the nuclear tests. The study concluded that 28 species were lost. Most of those were calm (lagoon) water specialists, whose habitat was most severely and permanently disturbed by the nuclear tests. If the disturbance event were to be repeated in the modern day, recovery would not be expected to be as high, due to the combination of additional stressors associated with climate change (Anthony et al., 2007; Lesser, 2007) and a possibly much altered atoll environment due to an additional 50 years of human occupation. Thus, in a twist of fate, the radioactive contamination of northern Marshall Island Atolls has enabled the recovery of the reefs of Bikini Atoll to take place in the absence of further anthropogenic pressure. Today Bikini Atoll provides a diverse coral reef community and a convincing example of partial resilience of coral biodiversity to non-chronic disturbance events.